Exeter, New Hampshire (CNN) - New Jersey Gov. Chris Christie fired back at protesters at a rally Sunday for Republican presidential candidate Mitt Romney in New Hampshire. The brash Republican governor - speaking on behalf of Romney, whom he has endorsed, ahead of Tuesday's first-in-the-nation primary - responded to chants from a group of attendees yelling "Mitt kills jobs, Christie kills jobs." "Really? 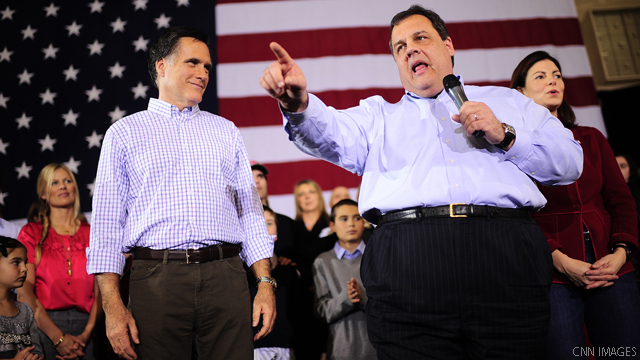 You know something may go down tonight, but it ain't gonna be jobs sweetheart," Christie said, before pointing to his record of job creation in the Garden State and predicting the economic growth possible in a future Romney administration. Christie blamed President Barack Obama for encouraging the actions of such protesters, who continued to chant sporadically throughout the rally. "You're disoriented by the ways of hope and change," the first-term New Jersey governor said, referencing the president's famous 2008 campaign mantra. Christie has frequented the campaign trail in support of Romney, the former Massachusetts governor and GOP presidential frontrunner. On Sunday, he accused the president of running a re-election campaign based on cynicism and anger. "It is the most cynical re-election strategy you could ever think of," Christie said. "The president is encouraging people to be angry at me, angry at Mitt, because we stand up for what America believes in." Christie gonna go gansta..better watch out. Christie is just another clown on the Republican campaign trail.